Shrimp and Bean-Thread Salad | What about this? Picnics or parties, that’s how versatile this easy do-ahead recipe is. It makes a great main lunch dish or a delicious dinner side dish. 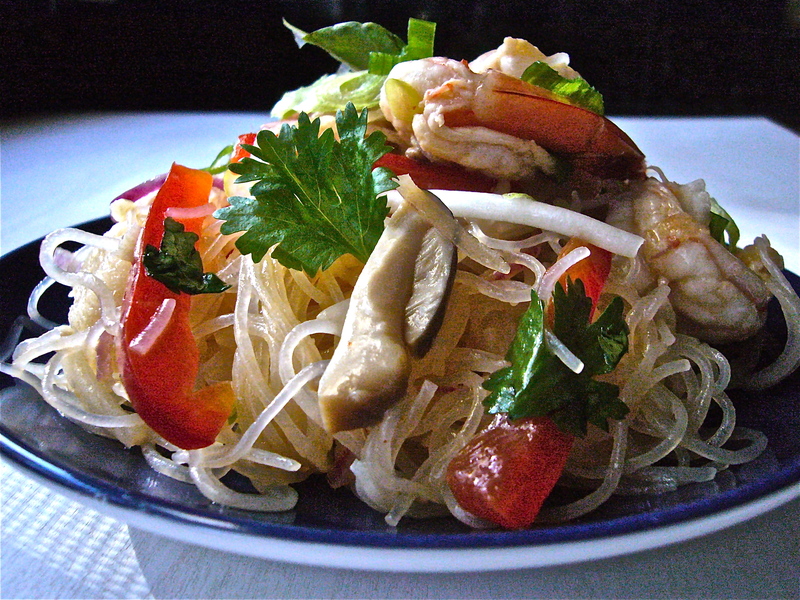 Bean threads are also referred to as cellophane noodles, Chinese vermicelli, crystal noodles, or glass noodles. They are transparent Asian noodles usually made from mung bean or yam starch. The dried form can be found in many grocery markets now and after reconstituting them with boiling water, they can be used in soups, stir-fried dishes, and spring rolls. Do not confuse bean threads or bean vermicelli with rice vermicelli, which are made from rice and are white in color rather than clear. Serves 4, or 6 to 8 sharing dishes. Soak the vermicelli in boiling water for 1-1/2 minutes. It will be semi-transparent and crisp-tender. Drain in a colander and cool under running cold water. Use kitchen shears to cut into 3-inch lengths. Transfer to a mixing bowl. Combine the dressing ingredients. Pour half over the vermicelli, mix well, and set aside. Shell the shrimp, leaving the last segment of the shell and the tail in place (reserve heads and shells for stock or bisque; they can be frozen until needed). Make a deep cut down the center of each shrimp’s back and pull away the dark vein. Press the shrimp open. Place in a dish and season with the fish sauce, lime juice, and sugar. Set aside. Prepare the remaining ingredients, except the oil, and add to the vermicelli in the bowl. Mix in evenly. Heat the oil in a small pan over high heat and stir-fry the shrimp until they turn pink. Remove and add to the salad, along with the reserved dressing. Toss for a few moments to thoroughly combine the ingredients and moisten evenly with the dressing. Pile onto a platter and serve. Do-ahead note: The salad can be made ahead, covered with plastic wrap, and refrigerated for several hours before serving. The salad dressing recipe made a very small amount. I was skeptical that this would be adequate, especially since the bean threads would continue to absorb the dressing as it sat in the refrigerator. I doubled the dressing recipe and was glad I did. Although the minced garlic is optional in the dressing, I would include it. Don’t skimp on the herbs, either. They bring a wonderful fresh flavor to this salad. Enjoy! I’m a little late in posting but I tried this recipe and it’s fabulous-thank you! Thanks Jenny! Glad you liked it!